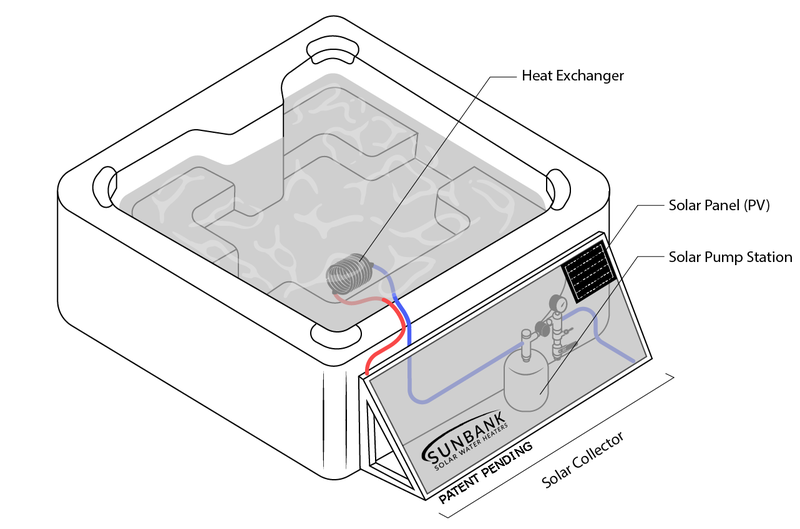 You know that the Sunbank Solar Hot Tub Kit is the least expensive way to heat a hot tub, but how does it work? 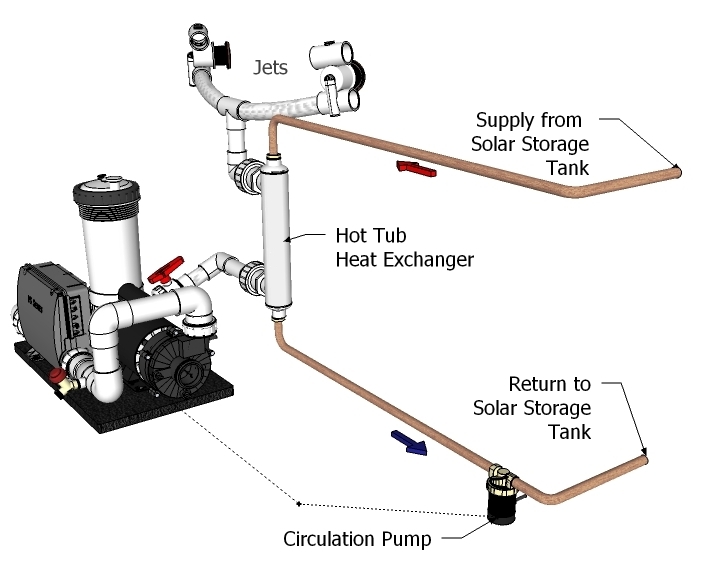 At the heart of the solar hot tub kit is a solar collector meant for high temperature applications. The Sunbank solar flat plate and evacuated tube collectors are industry leaders in performance, cost, and durability. All of our collectors are rigorously tested and SRCC certified. As opposed to solar pool collectors that are made of LDPE plastic and are meant for lower temperature applications, our collectors are made of copper and suitable for high temperatures. For the plumbing connections between the solar pump station and both the collector and the heat exchanger, we have chosen push fit plumbing fittings which allow you to make the plumbing connections by simply pushing the pieces together. The kit comes pressure tested, leaving you with no concerns about teflon tape, tools, and leaks. 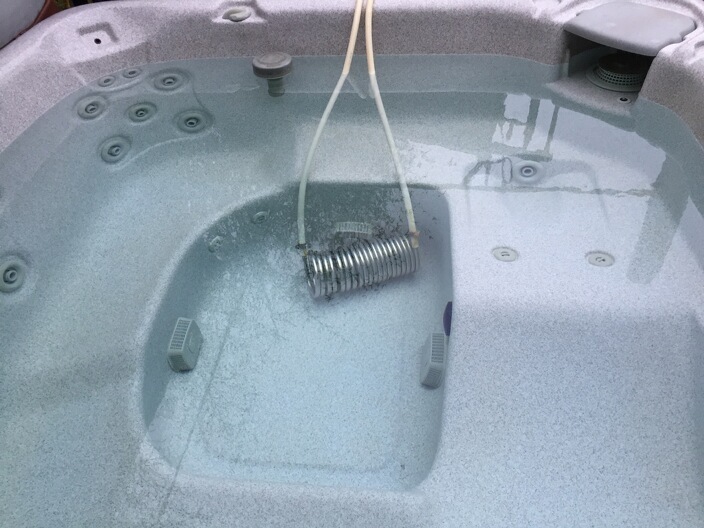 The heat exchanger separates the hot tub water from the solar collector fluid. This is an important design feature for a number of reasons, like freeze protection and keeping the corrosive hot tub water out of the solar collector. We offer two heat exchange options: the drop-in heat exchanger and integrated heat exchanger. 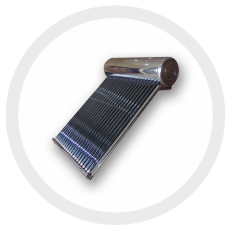 The drop-in stainless steel coil heat exchanger can usually be hidden in the filter compartment, but is shown here in the tub for illustration. This heat exchanger has the advantage that it exchanges heat with the hot tub without having to alter the hot tub’s internal plumbing. It’s literally as simple as dropping it into the hot tub water. This arrangement is very efficient and there is no concern that the coil will get too hot as it is surrounded by the thermal mass of the water and slowly adds heat to this mass throughout the day. The integrated stainless steel heat exchanger interfaces directly with your hot tub’s plumbing system providing a seamless heat transfer. This heat exchange option is only available for tubs that have a 24 hr filtration pump. This heat exchanger is specifically designed for pools and spas and is made from stainless steel so as not to corrode. If your hot tub is located in a place that gets a lot of sunlight then you can attach your hot tub kit directly to the south side of the hot tub. If the roof above or the yard next to the hot tub is the best place, then let us know the distance between the tub and collector so that we can build your kit correctly. Because it is a pressurized closed loop, the pump can overcome the distance to a third floor roof or a collector mounted on the other side of the yard.